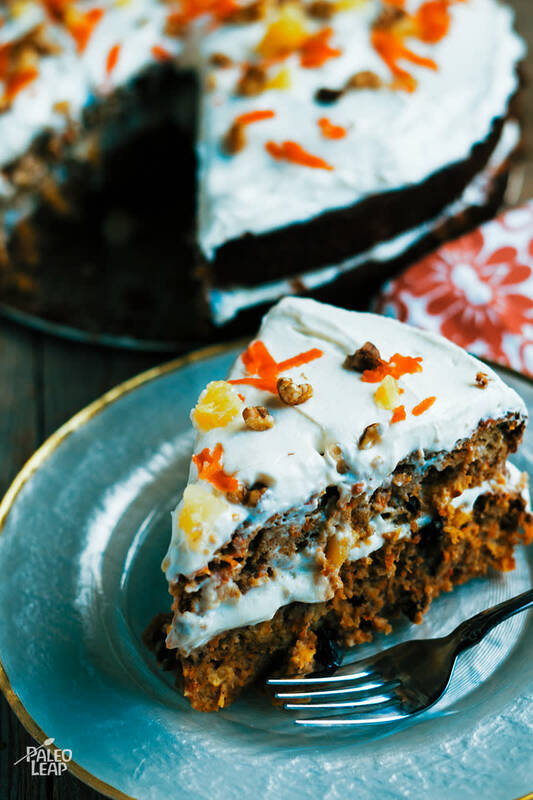 There are a great many Paleo carrot cake recipes out there, each one more moist and delicious than the next. Today, we are gifting you our version and we do hope that you take an enormous forkful from it! Since you are going all out to impress your guests, or rather just to satisfy your own cravings, you won’t want to miss out on the whipped cream. It is like a decadent non-marshmallow cream, that will leave you with an empty bowl, should you sample too much before the carrot cakes are out of the oven. Of course, you won’t be needing any more dessert after this slice of rich cake, but if you really need something to wash it down, then a cashew latte may do nicely to quench your thirst. Otherwise, a good old cup of black coffee or steaming tea will bring the ambience of the café right home to you. In one bowl combine all the dry ingredients, in another bowl whisk all the wet ingredients until well combined. Pour the wet mixture over the dry ingredients and mix until everything is well blended. Add the carrots, raisins, and pineapple to the batter and mix again. Divide the cake mixture equally between two 8-inch cake pans lined with parchment paper. If using larger or smaller cake pans, you’ll need to adjust the cooking time accordingly. Bake in the preheated oven 25 to 30 minute or until set. Let the cakes rest 15 to 20 minutes before removing from the pans. To make the whipped cream, blend the tapioca flour and coconut sugar in a food processor until you get a fine powder. Add the coconut cream, coconut milk and vanilla extract and mix until you get a creamy, fluffy texture. Spread the whipped cream over one cake, add the second layer, spread remaining whipped cream on top and sprinkle with chopped walnuts.